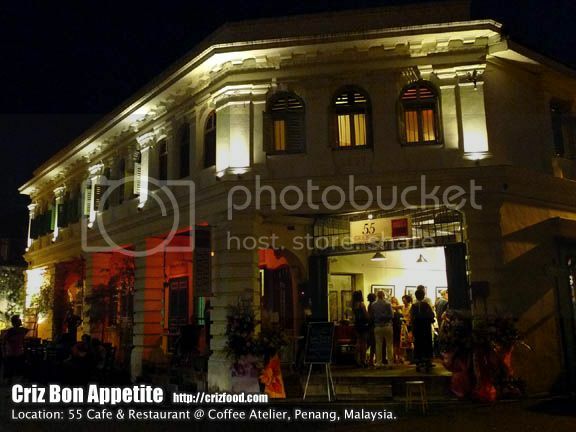 Within the heritage area of George Town, along Lorong Stewart, Penang, lies 55 Café & Restaurant @ Coffee Atelier, a brand name that had been established amongst the locals and expatriates for its delicious Mediterranean dishes and aromatic coffee brews. The café has now extended its operation hours to 10.00pm on Thursday to Saturday, serving basically all tapas (40+ types) which would include items ranging from scallops, prawns, squids, salmons, vongole, other seafood, chicken, beef, pork, cheese, Spanish omelette, potatoes, vegetables, pickles and bread. We started the meal with some Cocktail Pickles (RM8+) or commonly known in Spain as Banderillas. 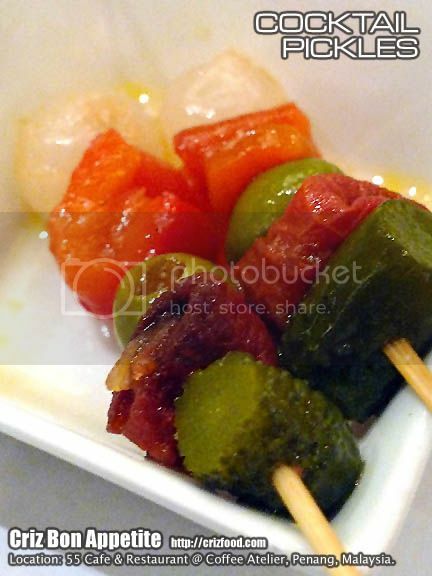 These easy tapas basically consisted of ready pickles in a jar or homemade pickles, all skewed on a toothpick. The trick is to make them as colorful as possible with flavors that complement each other to excite your pallet. The ones served here had cocktail onions, pickled Jalapeno red pepper, stuffed Manzanilla olives, homemade sundried tomato and pickled gherkins. 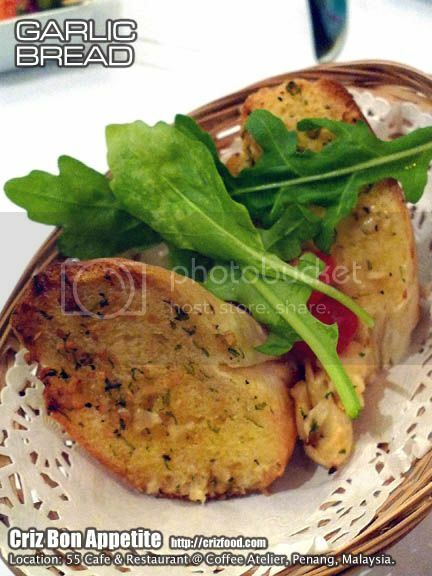 The Garlic Bread (RM6+ for 2 slices) served here was perfect. The kitchen managed to get the slices to maintain the crispiness on the outer layer while maintaining the softness inside. These were served with some fresh rocket lettuce, cherry tomatoes and roasted garlic. One of my favorite tapas here has always been the Gambas el Pene (RM18+). It has a marinated large prawn, sprinkled with some paprika and chives, folded in between a thin slice of baguette and baked until perfection. The dish was beautifully prepared but not as moist and fragrant as my homemade ones. Well, I was using virgin coconut oil instead of olive oil for the extra fragrance with lots of chopped garlic. 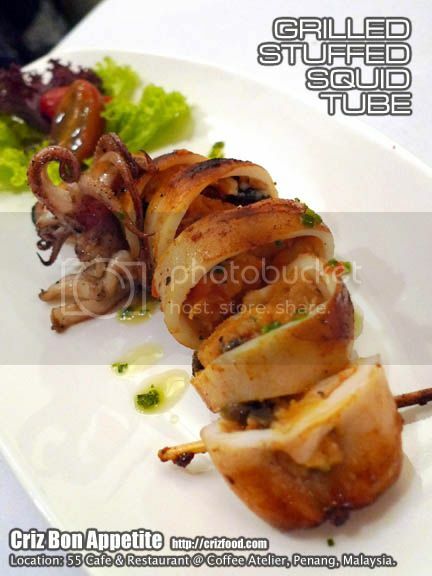 The Grilled Stuffed Squid Tube (RM16+) was awesome. It had a combination of diced prawns, tomatoes, chopped black olives, onions, chives, bread with a light sprinkles of spices as stuffing. It went well with some baguettes. We had two versions of sauces for the grilled salmon. 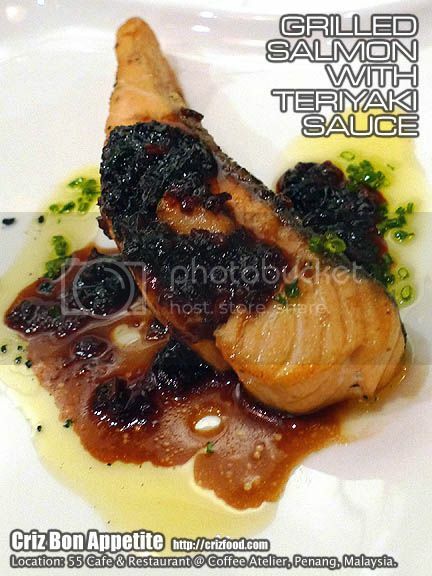 The first one was the Grilled Salmon with Teriyaki Sauce (RM20+). 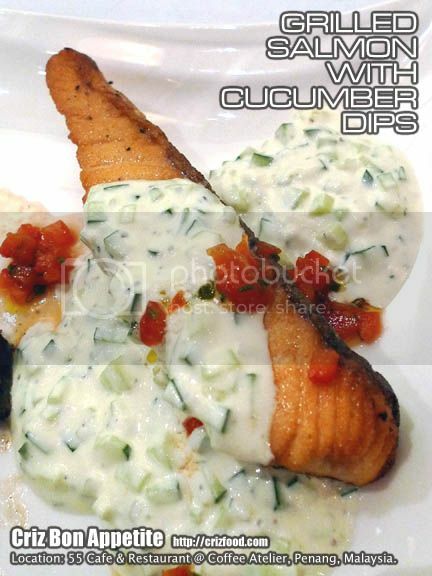 The flavors from the sauce combined with the freshness of the salmon would make this dish a great tapas dish. Compared to the former dish, the Grilled Salmon with Cucumber Dips (RM20+) was real refreshing and it came with some rich flavored sautéed Shitake mushrooms. However, I personally felt that it would be a better main dish than served as tapas. 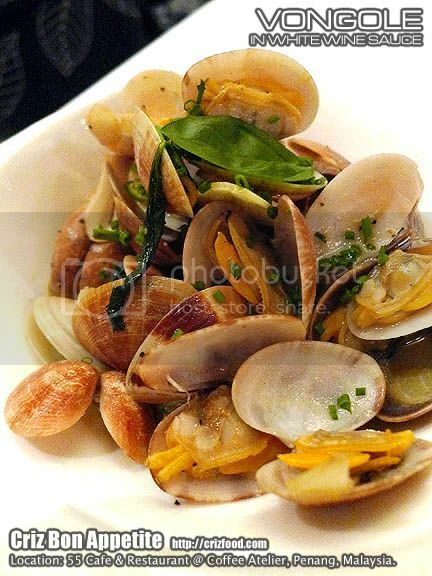 If you are a fan of all species of clams, you will surely fall in love with the next dish which was the Vongole in White Wine Sauce (RM18+). Apart from the freshly selected clams, the sauce was heaven! 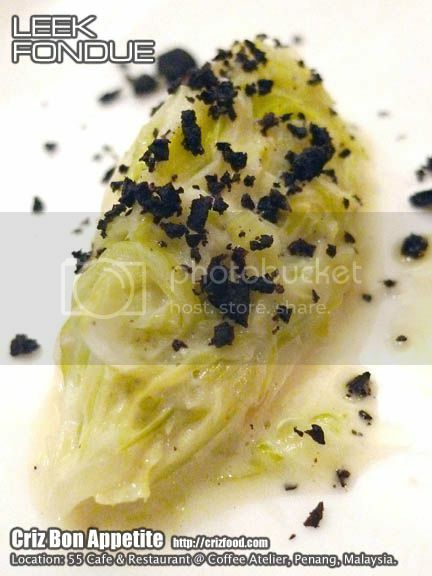 It had the flavors of some virgin olive oil, chives, white wine, black pepper, salt, garlic and more. I was happily dipping in my baguette to clean up the bowl~ LOL! 😛 We had a bonus that day as some seasonal mini crabs were added in for that extra flavor as well as crunch. We also had two types of sauces served with our pan-grilled beef tenderloin. 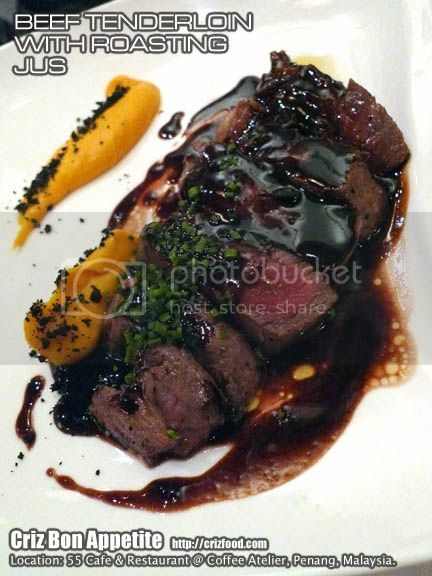 The first was the Beef Tenderloin with Roasting Jus (RM28+). The beef was done medium rare, just right for that wonderful bite. The roasting jus was tasty as you can taste the tedious task of reducing the beef stock to a thick consistency almost like the Bovril. The flavorful extract with a slight saltiness went well with the baguettes. This meat was served with some mashed kumara with some sprinkles of olive powder. 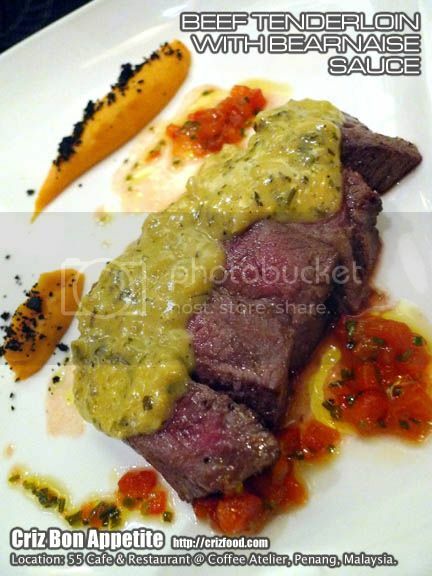 The next dish which was the Beef Tenderloin with Bearnaise Sauce (RM28+) was served exactly the same way but with Bearnaise sauce replacing the roasting jus. The traditionally used light yellow, opaque, smooth and creamy sauce for steak, had a mild herbs and spices eggy after taste, most probably with the added in chervil, terragon, shallots, coarsely crushed peppercorns with egg yolk and butter. No doubt it was nice but my preference would go to the lovely roasting jus. 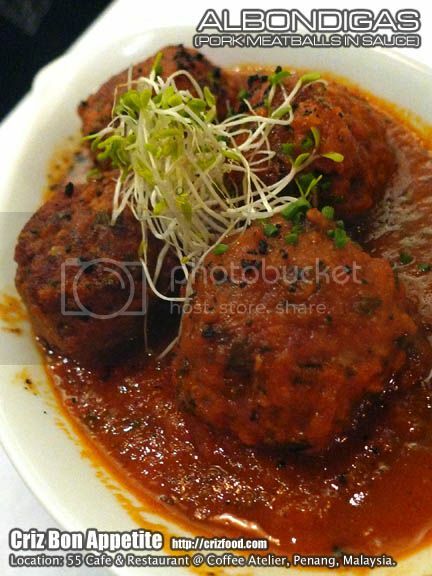 The Albondigas (RM16+) or commonly known as pork meatballs in gravy was something nice to go with your baguettes. The marinated minced pork with some herbs and seasoning went well with the tomato puree like gravy. It would be great if more breadcrumbs, onions or even other tenderizer be added in to soften the meat a bit more. 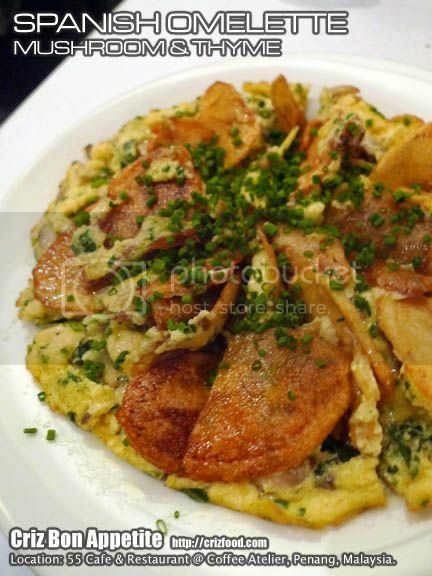 The next dish was the Spanish Omelette with Mushroom & Thyme (RM12+). It was just a somewhat stuffed omelette with a slight Tabasco sauce flavor topped with some deep fried potatoes. 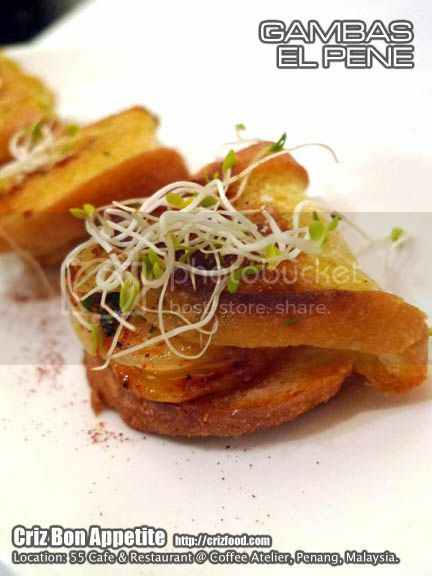 For those who love to have vegetable tapas, you can try out their Leek Fondue (RM10+). It was just a creamy spread for your baguette. 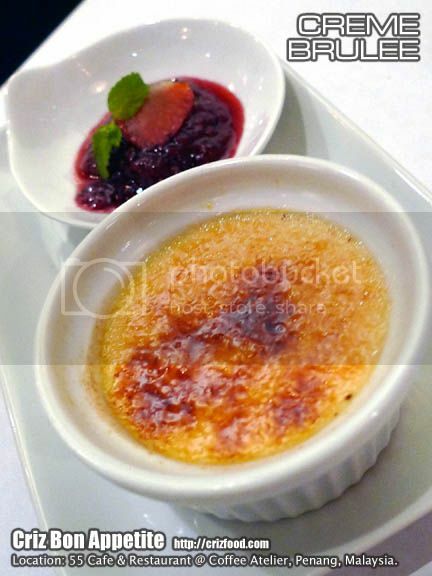 As it was rather filling with all the food, we still managed to try out their Creme Brulee (RM13+). Their version has a thin layer of burnt sugar. It went well with their homemade berries compote. 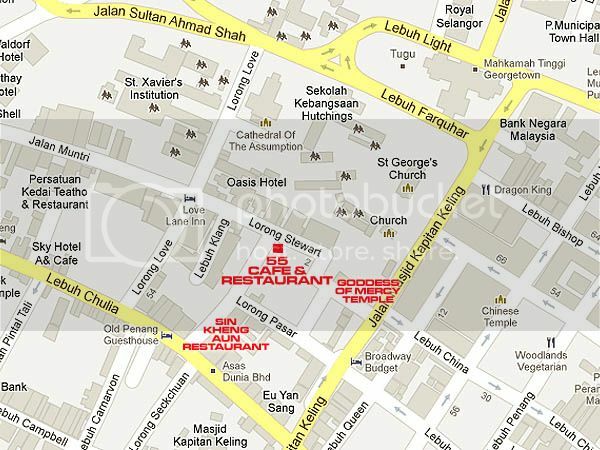 Overall, the food served here has its own unique flavors with a slight touch of fusion and can be well accepted by the locals as well as foreigners. Please also note that there would be a 10% service charge applicable for all purchases.